We chose Bryson Law Firm, LLC from searching online and saw it was located nearby. They helped me by resolving my issues with LDR with the results I expected. The account was handled in a professional and timely manner. It took one phone call to Bryson Law Firm, L.L.C. to discuss the issues and what information they needed, and within a week I got a return call stating the results and closure. The results were outstanding and I was very satisfied with the service. We decided on the Bryson Law Firm because of their introductory letters we received and the fact that the office was located in driving distance to where we could talk with representatives face to face. We met with both Mr. and Mrs. Bryson. We left the meeting feeling 100 % less stressed and that we had found the people who would provide all the help we needed. The Bryson Law Firm helped tremendously during the course of resolving our tax situation. Our case managers were courteous, helpful, and always responsive. When we wanted to speak to an attorney, it was done readily. The face that we were always treated courteously was what stood out from our experience with Bryson Law Firm. If anyone that I know has a tax problem, I will tell them to seek help from the Bryson Law Firm because they will work with you until the problem is completely resolved. We chose Bryson Law Firm, LLC after we heard their advertisement on the radio. The firm helped us by greatly reducing the amount of money the IRS wanted from us. One thing that stood out for us was how pleasant everyone was to talk to and how they answered every question we asked. I feel like I received 100% service from the firm. 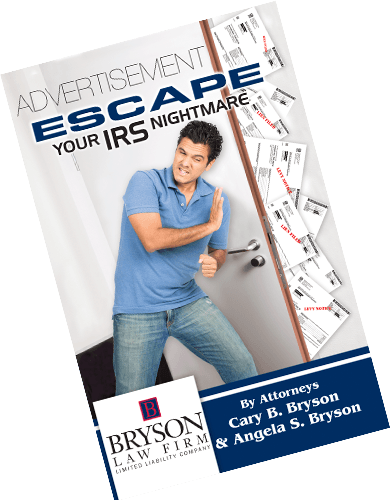 The IRS wanted $197,000, but Bryson Law Firm gave us a future and resolved for $30,000. If you have a tax issue, don't wait or hesitate! Call Bryson Law Firm ASAP, 100% satisfaction. Your Performance Level was 100%! I first heard about Bryson Law Firm, L.L.C. on the radio and was impressed with the commercial. Every time I called or went by y'all were so polite and helpful in every way. They helped to get my tax problem solved. One thing that stood out for me was that there was never a question asked that they could not answer. I do not think the Bryson Law Firm, L.L.C could improve on anything... your performance level was at 100%! When telling and family about the firm, I will say that they get the job done! We were referred to Bryson Law Firm, L.L.C. by another attorney. The firm's knowledge and helpfulness are exceptional. They were always attentive and sensitive to any issue or question that we had. Aside from the obvious assistance with the Internal Revenue Service, we were given peace of mind, which is priceless. I cannot narrow down any one thing that stood out when working with Bryson Law Firm, L.L.C. The staff was professional, non-judgmental, prompt, kind, and reassuring. If family or friends are ever in a tax situation, Bryson Law Firm, L.L.C. would be recommended as the only place they should go! They Handled Everything for Me! I heard Mr. Bryson's ad on the radio. You were local and Mr. Bryson sounded so sincere in the commercial. The Bryson Law Firm, L.L.C. was very knowledgeable and helpful. Everyone that I spoke to in the office, (Maggie, Jennifer, Ashley, and Brandon) handled everything for me. All I had to do was review and sign papers! The thing that stood out the most for me was everyone's kindness and their sincere desire to do everything they could to help me and my tax situation. I have no suggestions on how the firm can do better because I have no complaints! When recommending friends and family, I would tell them that everything written above! I Will Tell My Friends & Family that Bryson Law Firm Can Get the Job Done! I chose the Bryson Law Firm, L.L.C. because I needed help with dealing with the IRS. The firm was knowledgeable and helpful by taking their time in explaining what I needed to know about my tax problems. My experience with them was very helpful. The only thing that they can do better is nothing! Keep doing what is best for the clients. I will tell my friends and family that the Bryson Law Firm, L.L.C. can get the job done. They Saved my Children's Inheritance! I paid $170,000 plus to the IRS with my husband's life insurance and they wanted $56,000 plus for his estate. I could not see them getting everything else! The Bryson Law Firm, L.L.C. was most definitely knowledgeable and helpful. They saved my children's inheritance! They helped me by giving me options to choose a way to pay off the bank to keep my 40 acres of land, and not have to give the IRS any more money. Understanding that the person helping me before did NOT have my best interest at heart is what stood out about my experience with the firm. I would advise anyone with IRS problems to use the Bryson Law Firm, L.L.C. I would be happy to speak to anyone questioning you. I chose Bryson Law Firm, L.L.C. because the Better Business Bureau referred me to them. I was informed of the compromise I would most likely qualify for. They helped me qualify for one of the compromises. Everything was handled on a professional basis, and I cannot think of a thing the Bryson Law Firm, L.L.C. could do better. I will tell my friends and family to use this firm to handle any tax problems. I decided to work with Bryson Law Firm L.L.C. because of all the amazing reviews I heard about them. Cary was very knowledgeable and answered every question I had. Bryson Law Firm L.L.C. negotiated a payment plan that I could afford. Also, I never had to deal with the IRS directly! Everyone was so friendly and always eager to help anyway they could. I could not have asked for a better team backing me! If my friends have tax issues I tell them there is no one better than Bryson Law Firm L.L.C. I am the owner of a large sales organization and experienced a very severe issue with the IRS. I was proactive in resolving with the IRS and we agreed on a structure which I honored. Unfortunately the IRS lost or misplaced documents and refused to acknowledge our agreement. Instead of starting a very lengthy process again, I did thorough research and Bryson Law Firm, LLC always came to the top for assistance in this matter. My personal visit to the firm was encouraging and I immediately had confidence that I was in the best hands available. I was privileged to communicate with Cary, Angie, and my case worker Samantha anytime I needed and always received a timely response or answer. There were a few situations where I received erroneous certified letters from the IRS and was relieved that Bryson Law Firm, LLC immediately resolved each issue. Twice I called or emailed on a weekend and received responses both times. I doubt this would have happened with any other firm. 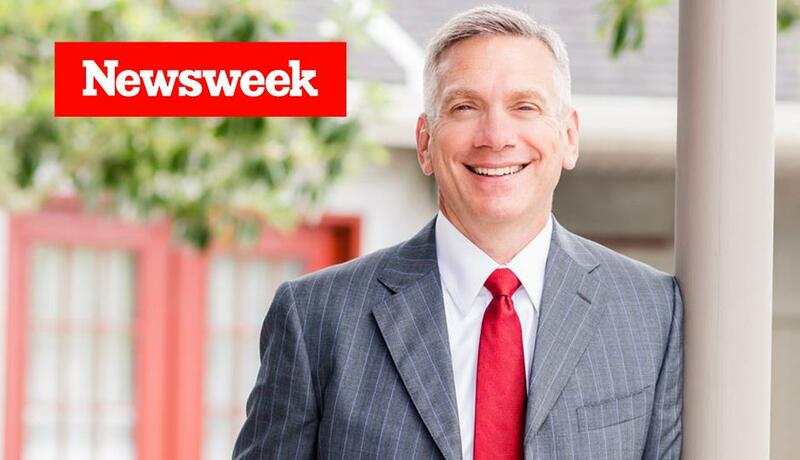 I was most impressed with the knowledge of the entire firm and their concern that I know absolutely every option and any scenario that I might face. Probably the most important single comment I could make is that I never felt forgotten, ignored, or that I was just another name or number. My account was recently resolved in a manner that was very acceptable to me. I remain indebted to the Bryson Law Firm, LLC and will never hesitate to provide a personal recommendation when asked. After seeing Cary Bryson's video, "Three Things You Need to Know," I knew he was the right attorney for me. We shared some of the same views and I believed he could help me with my IRS tax problems. He was a no nonsense lawyer who got to the point. He was able to get the IRS off my back and settle my case! Everyone at Bryson Law Firm, LLC was very knowledgeable and helpful. Every time I would call, someone would give me a straight answer or point me in the right direction to get one. I can only say great things about Bryson Law Firm, LLC. 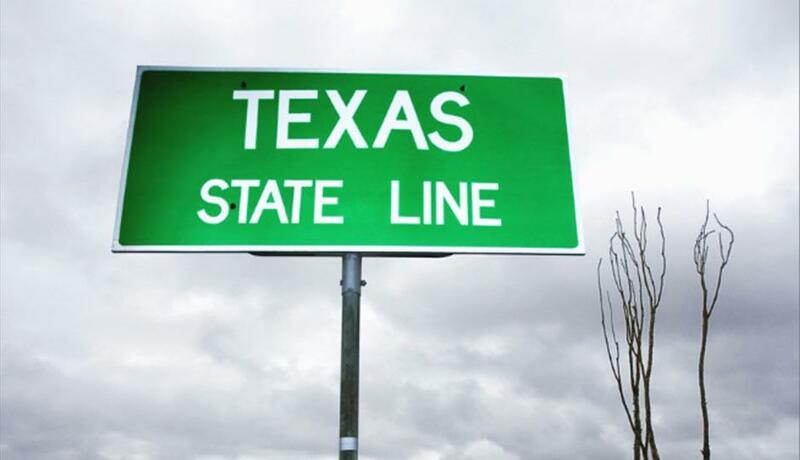 We decided that Bryson Law Firm L.L.C. was a good choice for us after hearing about their great reputation. The staff was able to immediately decipher all of the documents we received and explain them to us on a level that we could understand. They helped us sort through all the paperwork and got almost all of our penalties abated in a timely manner. We tried to accomplish this on our own; we even sent several letters to the IRS, but were still rejected. One letter from Bryson Law Firm L.L.C. and the penalties were abated and the money returned to us! The thing that stood out the most to us was the firm's expertise in tax issues and the compassion and understanding given to their clients. I intend to recommend Bryson Law Firm L.L.C. to all of my friends and family. Thank God for the few good people left that enjoys life and their job. I liked Bryson Law Firm, LLC's advertisements and the fact that they were local. I was glad that someone would be within reach and be able to communicate with me as my case progressed. Brandi Roche has been a great help! The answers to my questions may not have always been what I wanted, but they was correct and to the point. Bryson Law Firm, LLC is good at their job and handles business very well. Maggie Spallino and her soothing voice and great attitude have been so pleasant that she deserves credit for being such a great friend and comforter. Thank God for the few good people left that enjoys life and their job like she seems to! The peace of mind I felt when I left Bryson Law Firm, LLC after my initial consult remains with me even now. I was looking for a local attorney to resolve my payroll tax issues. I found Bryson Law Firm, LLC by an internet search. I liked what I read on your website so I made an appointment. They explained my options and made me confident that the problem would be resolved. The peace of mind I felt when I left Bryson Law Firm, LLC after my initial consult remains with me even now. They dealt with the IRS, so I would not have to and helped me comply with their requirements with confidence. The whole staff was very polite and cordial. I tell people to call Bryson Law Firm, LLC if they have tax troubles and would like peace of mind. I received a letter from Bryson Law Firm, LLC stating that I had a tax lien and that they could help me resolve my IRS tax problems. They did so much more than that! Bryson Law Firm, LLC really went above and beyond what I expected and did so much work to get my taxes straight and I will always be in their debt. They worked out a reasonable compromise with the IRS that I would have never been able to do by myself. Everyone was so nice and helpful. When I made mistakes on my tax documents, Bryson Law Firm, LLC called me and walked me through it step by step. I tell people that if they want a fair and really nice company to help with their IRS or Louisiana state tax problems to call Bryson Law Firm, LLC. They really know their business! I felt safe from the IRS for the first time in a long time. Once I met Cary Bryson, I was very comfortable. I felt safe from the IRS for the first time in a long time. I choose Bryson Law Firm, LLC because their commercials didn't make me feel icky like some of the national firms did. Before going to Bryson Law Firm, LLC I was lost; I didn't know what to do or where to turn. Everyone took their time and guided me along the correct path. They saved me! I could not have resolved the issues created for me by my ex-husband without their help. Everyone listened to me regarding the circumstances of my case and worked my defense along those lines. Now I tell everyone I know not to trust anyone else but Bryson Law Firm, LLC. I tell them that they will do everything possible to come to an equitable resolution. I was looking for a local firm to handle my IRS tax problems. I chose Bryson Law Firm, LLC because I felt that I could trust them more than these big national firms. They told me the truth about my tax problems and didn't hold anything back. Bryson Law Firm, LLC helped me alleviate all of those problems and got my taxes in order and current. Keep up the good work guys! Whenever anyone I know has problems with the IRS, I recommend Bryson Law Firm, LLC every time. It was wonderful to be able to find a firm that was Christian oriented & kept integrity in mind. After hearing Bryson Law Firm's advertisement on the radio, one of our church elders was prompted by the Lord to seek assistance. Everyone at Bryson Law Firm, LLC was very thorough, quick, and detailed about helping us with our issues. Once they began handling our case, we were able to see just how knowledgeable they were in handling IRS problems. The staff is also very understanding and polite. We owed a large sum of money to the IRS and ended up paying very little. The thing that stood out the most is the ability of the staff to stay on task and get things resolved as quickly as possible. Also, everyone was very friendly! It was wonderful to be able to find a firm that was Christian oriented & kept integrity in mind. We tell our friends and family that Bryson Law Firm, LLC is an excellent Christian law firm that will certainly get the job done, and in a timely manner. Angie Bryson went out of her way to try and calm our nerves and answer any questions we had. 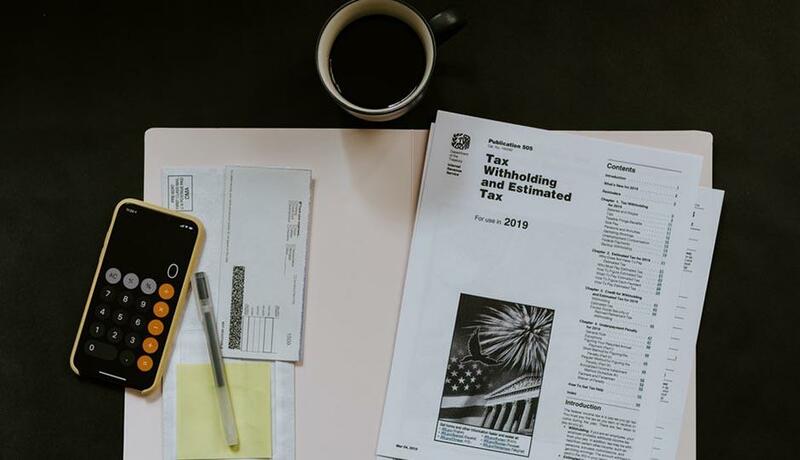 Bryson Law Firm, LLC has helped other people we know, so when looking for help with our own taxes, they were the obvious choice. They were very knowledgeable and helpful. Angie Bryson went out of her way to try and calm our nerves and answer any questions we had. Bryson Law Firm, LLC also helped file our taxes and make arrangements for our payments to the IRS. The one thing that stands out in our minds is the compassion showed to us by Angela Bryson and the staff at Bryson Law Firm, LLC.